The mechanisms of sensory perception and the overlap of natural science and technology are the central themes in Carsten Nicolai’s visual art and music. Inspired by scientific referencing systems, he has a deep interest in mathematical patterns, such as grids, codes, error, and coincident structures, as well as in phenomena of self-organization. In particular, he focuses on sound, delving into the possibilities for making it visible. He attempts to materialize sound waves in other media, such as graphics, sculpture, and digital images. His graphics series Tape Loop (1998) shows an elegantly shaped Moebius strip of audiotape. His sculptures Yes/No (2008) and Zukunftsangst (2015) each transfer the audio graph of the sculptures’ titles into aluminum, as if the sound waves had frozen into material form. 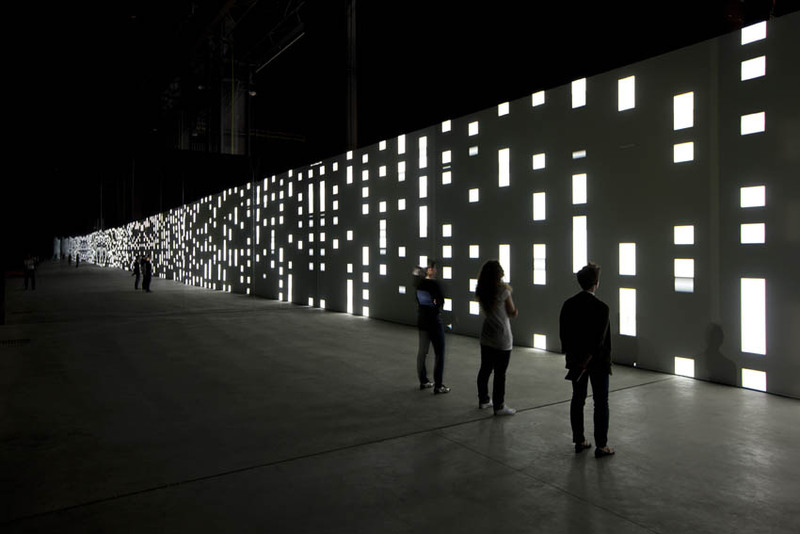 His graphic series unitxt (2011), the title of which can be read as both »unit extended« and »universal text,« is based on computer-generated patterns manipulated through an audio signal. It is part of a group of works that deal with the ambivalence of the prefix »uni,« which implies both particularity as well as unity. The video/audio piece Univrs and the installation unidisplay / uni(psycho)acoustic (2013) are also part of the group exhibited in Double Lives. Carsten Nicolai appears as a musician under the pseudonym Alva Noto and is a prominent exponent of electronic music and minimal techno. He was influenced by the electronic synth sounds of Einstürzende Neubauten in the Chemnitz of the early 1980s as well as by Depeche Mode and Klaus Schulze, with whom he still collaborates artistically today. In the 1990s, he published Milles Plateaux on the legendary Glitch und Arthouse label. In 1999, he founded the raster-noton label with Olaf Bender. His work is constantly being recontextualized in his multiple collaborations with artists like Scanner, Thomas Knak, Mika Vainio, Michael Nyman, Ryoji Ikeda, and Ryuichi Sakamoto. In 2010, he worked on the project ANBB with Blixa Bargeld (Einstürzende Neubauten). So far, one EP titled Ret Marut Handshake and the album Mimikry have appeared. In October 2010, Nicolai presented his sound-and-light piece as part of an event for the exhibition Not in Fashion: Mode und Fotografie der 90er Jahre at the Museum für Moderne Kunst (MMK) in Frankfurt in collaboration with the fashion designer Kostas Murkudis from Dresden. For the Ruhrtriennale 2012, he collaborated with Ryuichi Sakamoto and the Ensemble Modern. Carsten Nicolai, working under the name Alva Noto with Ryuichi Sakamoto, created the music for The Revenant in 2015. The film’s soundtrack was nominated for a Golden Globe Award in the category Best Film Music in 2016. Univrs (uniscope version), Live at the Maerzmusik Festival, Kraftwerk Mitte, Berlin, March 2011, with Carsten Nicolai, 47:44 min. As with many works by Carsten Nicolai/Alvar Noto, Univrs begins with the Latin prefix »uni,« which implies both particularity and unity. The artist invokes both meanings. The images and sounds in this work are based on computer-generated structures manipulated through an audio signal. This produces interference in the software and hardware such that the same image is never repeated. In music, this use of calculated interference is called the »glitch« method and has its predigital models in the random procedures of John Cage.